KARACHI : Pakistan opening batsman Fakhar Zaman has stated that he loves playing under the captaincy of Sarfraz Ahmed despite getting a lot of stick from him. Speaking in an interview with Daily Express, Zaman said he knows Sarfraz better than most players because of playing alongside him in Karachi for a significant period of time. 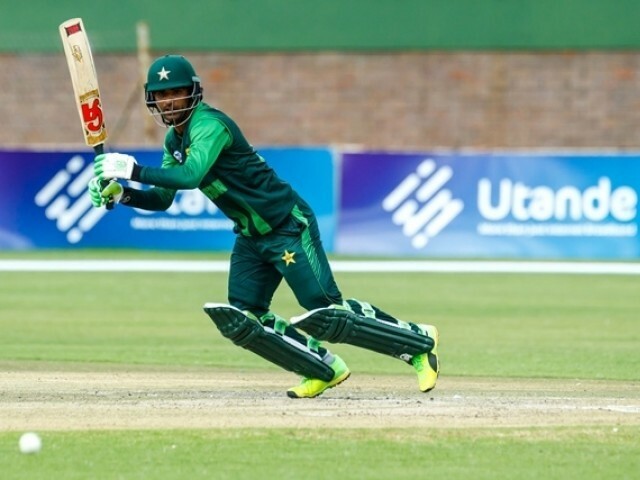 Zaman, who has been commonly associated with the epithet ‘Fakhar-e-Pakistan’ due to his great run of form in the recent past, said he is glad to get so much love from fans while adding that it is an honour to represent the Men in Green. After becoming the first Pakistan player to score a double century in ODIs, the comparisons with former Pakistan opening batsman Saeed Anwar have grown stronger but Zaman feels it is too early to make such an association. Zaman scored 515 runs in the five-match ODI series against Zimbabwe and bagged the award for player of the series and the left-hander revealed the only thing on his mind was to bat for as long as possible once he got his eye in. Despite breaking numerous records during the recently concluded Zimbabwe tour, Zaman is not too particular about them and keeps his focus on one match at a time. “I don’t have any specific milestone in my mind as I look to focus on one match at a time and perform to the best of my ability,” he said. Zaman also said that he is keen on becoming a regular in the five-day format as well.